These bracelets were crafted in a far… faraway desert to resist and endure in time, even in the hardest conditions. New Release for eBento Feb. Round. 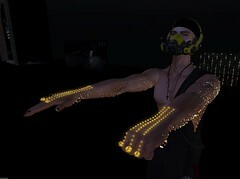 Posted in E.V.E Studio, News, Second Life, wardrobe and accessoriesTagged accessory, apparel, bracelets, E.V.E Studio, female, scorpion, spikesBookmark the permalink.